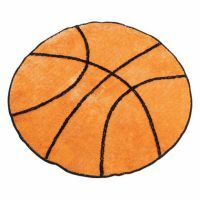 The Basketball Rug is a creative carpet that mimics the real thing. It is a perfect accompaniment for any basketball lover’s collection. Whether it is placed as a decoration or used as a carpet, this durable 100% acrylic rug can withstand stains and wear-and-tear. Great for any age.